“United in diversity” is the motto of the European Union. It signifies how Europeans and global citizens have come together, in the form of the EU, to work for peace and prosperity, while at the same time being enriched by the continent’s many different cultures, traditions and languages. To celebrate the diversity of languages throughout Europe and their beauty, the Young European Federalists (JEF) Frankfurt and the International Exchange and Erasmus Student Network Frankfurt (ESN Frankfurt / Hermes Club e.V.) host a cool winter event in this spirit for the very first time: The Night of European Winter Tales! 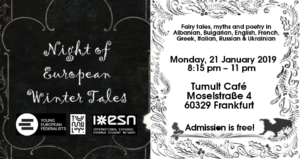 Native language speakers and folks gifted with language skills will be reading out fairy tales, myths and poetry with a winter theme in their original language. Let yourself be mesmerised and thrilled by the sound of foreign unknown languages and get in the right winter spirit with this alternative event to fill your heart with warmth in times of chittering and frostiness outside. We will have fairy tales, myths and poetry in Albanian, Bulgarian, English, French, Greek, Italian, Russian and Ukrainian. For a better mutual understanding, we will distribute booklets with the respective English translation to read along and take with you. To make this alternative winter event a success, we are in need of you! Let us know, whether you are able and would be willing to read out poetry in a foreign language or if you would like to attend the event as a dedicated and listening guest in the audience. We need both, but we have to make sure that enough people like the idea the same way we do. Only this way we can launch this new project. If you are interested, please fill out the following short form. I want to receive the newsletter of JEF Frankfurt for further activities and events. Dieser Beitrag wurde unter JEF Frankfurt abgelegt am 21. Januar 2019 von Tilmann Hartung.